More companies which use direct mail are using the 2nd class Machin PPI format now, the latest being Laithwaites Wines. These were originally mentioned back in September when the trial period was announced. 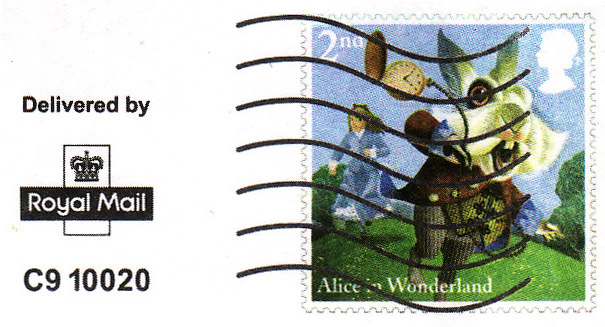 From this example it is clear that the PPI area is whiter than the rest of the envelope or on a label, but it doesn't appear to be a label. Thanks to Tom, Adrian and Robert for reporting this latest use. 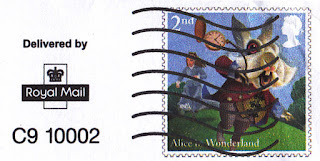 § There are still no reports of the alternative stamp image, which was one of the two Alice in Wonderland 2nd class, nor any 1st class examples. § My thanks to John Enfield for reminding me that two examples of the Alice in Wonderland were shown in the Journal of the British Postmark Society. C9 10002 was initially used on mailings by Holiday Property Bond. As with the Machin version, shades vary. 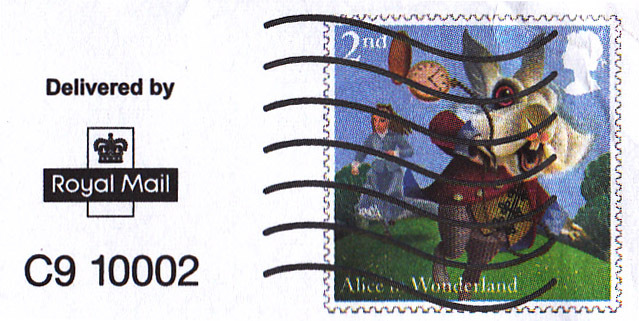 I reported in the January 2015 'British Postmark Society Journal' that the Alice in Wonderland 2nd class design had been seen as a 'pre-cancelled' PPI on mailings handled by both whistl (licence C9 10002) and Citipost (C9 10020). The latter was shown in the same journal, while the former was shown in October 2015. The trial announced by Royal Mail as lasting from September to November 2015 seems to have been extended, but no 1st class designs were included in the trial. This seeems appropriate, as downstream access (C9) mail essentially gets as a second class service - 'posted' on day 1, sorted by the Mail company on day 2 and transported to Royal Mail Mail Centres for delivery on day 3.